Sometimes it’s not always just about the treasures that we can keep or the awesome relics that many of us like to display. Another fascinating part of our great hobby that I particularly enjoy is often over looked by some. 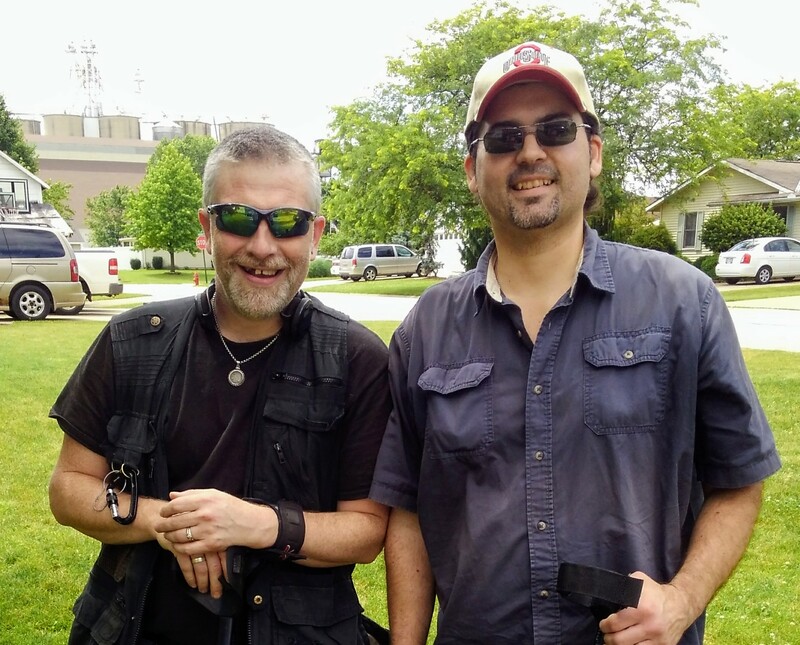 Don’t get me wrong, I love to get out there and recover coins, jewelry, and relics just like the rest of you; however, many times I also enjoy taking the time to help put a good light on the hobby by utilizing skills and equipment to do great things for other people. I’m talking about the good deeds that many of us out there do for others. Recoveries and returns. In the past I have been called upon to locate or recover various items, property markers, lost jewellery or keys, and once I was even asked to locate a titanium barreled dart used in dart leagues. sometimes its even been just checking an area for dangers that other people may be injured on, such as needles, knives, rusty nails and etc. The universal factor in all of these is that no matter how big or small it was a task for a good purpose. Many times these items meant more sentimentally to those that have lost them than the actual cost of the items. Even though some of these items can be replaced its just not the same. With the Deus being such a versatile machine it is an asset in many of these tasks of recovering lost items. A while back I received a phone call from a good buddy of mine. He wanted to know if I still do metal detecting and ring returns for people who have lost their rings. 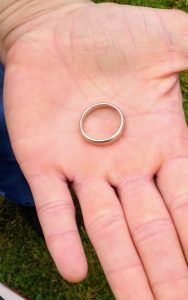 My answer was short, “absolutely, what is going on?” He said “I was out doing yard work and planting some bushes in my yard when at one point, after just planting a bush, I looked down and noticed that my wedding band had slipped off of my finger and was laying on the ground. I picked it up and slipped it into my shirt pocket and continued on with my yard work. After planting the last of the bushes I headed back into the house and that’s when I realized that my ring was no longer in my shirt pocket. That was almost a week ago and now the yard needs mowed but I’m hesitant to mow with fear of damaging my ring. I have looked in my yard, priced replacement rings online and they are not cheap. Is there a chance that you can help me?” I asked him a few more questions and after finding out that the target was a 14 K, white gold wedding band, and not knowing what the environment was like I knew that the Deus was the right machine for the job due to its ability to change settings on the fly, to adapt to your environment in any given situation. I was very confident that the recovery and return would be successful! So we made arrangements to meet up. 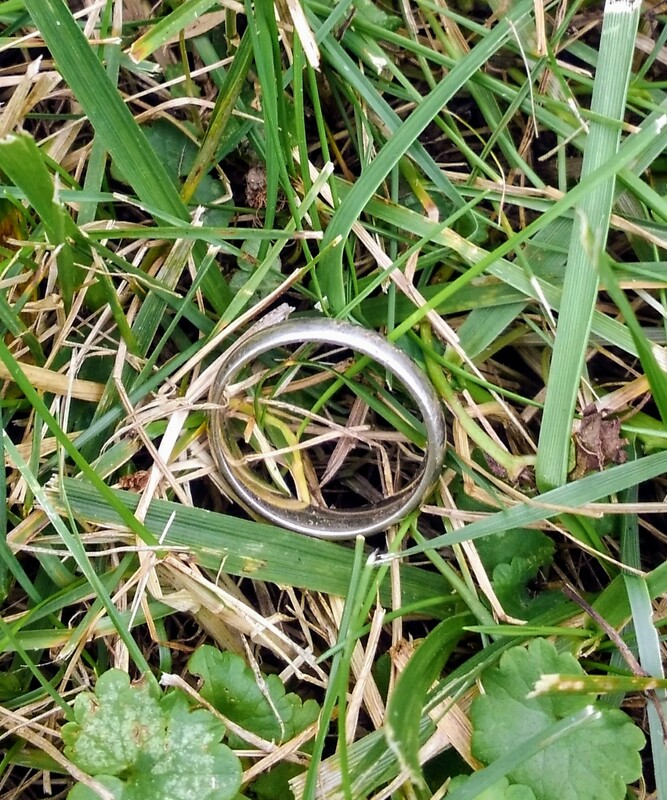 When I arrived at the location, my friend walked me around the yard and pointed out what he had done the day he lost the ring so that I could establish my search area. With knowing that the target was gold and most likely on the surface, I turned on the Deus and quickly checked my sensitivity, switched to 18 khz, and changed the audio to pitch. I began my search retracing his steps. I stopped along the way to investigate a target and quickly determined that it was not what we were looking for. Continuing on along the path I suddenly hit a very clear and consistent signal. I thought to myself, “that sounds just like it’s right on the surface”. Since it was in the right area I reached for my MI-6 Pin-pointer as I crouched down on the ground to investigate the signal. Before I even had the chance to activate the pin-pointer I could feel something under my hand in the grass. 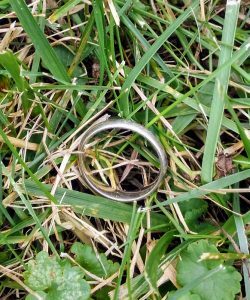 As I moved my hand away I could see a white gold wedding band peeking out of the grass. The Deus had located the ring and my friend was very happy to have his ring back! As for his wife, she had no problems taking this picture…You know what they say…Happy Wife, Happy Life! 5 minutes of work with the Deus saved the day! 2 Responses to "Happy wife… Happy life. 5 minutes with Deus Saves the Day. By Josh Kimmel"
It is definitely rewarding to see the looks on the faces of the individuals when they get their lost items returned. Many have sentimental value to those people. Great article!